Offer your guests convenience and comfort with this Choice 15" x 17" white 2-ply dinner napkin! Featuring bright white coloring, this versatile napkin is the perfect complement to any decor. Boasting a soft, absorbent construction, this napkin is a practical addition to your table setting. With its 2-ply design and large 15" x 17" unfolded size, this napkin is perfect for cleaning up spills. It also easily covers patrons' laps to protect their clothing throughout their dining experience. 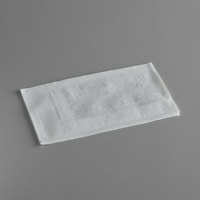 These dinner napkins are suitable for a bar or restaurant looking for a low cost napkin. Quality isn't as nice as the Response brand, but does the job. These napkins are a good value and are surprisingly soft. I took off one star because they are a little wrinkled when they come out of the package. I don't think this would be an issue if you were using them in a napkin dispenser. Good quality napkins, very soft and thick. Size is good and price is unbeatable. It has a look of some fancy disposables napkins. Very happy with the purchase. These are a great choice for a napkin in our tasting room. They are thicker, and just make a good impression with customers. We will be ordering these again. Choice white dinner napkin. I give two per customer. It’s pretty good for the price but I feel that it will still rips. So until I find that cost effective better napkins we will stick to these. These dinner napkins are thick and perfect for our in-house and to-go customers. They come packaged in nice sleeves that make it easy to just full a few and store well. Strong napkin, perfect for carry pout, we also hand out with pizza slices, were using cocktail naps but these are priced right so they work. These are great cheap, utilitarian napkins. They're not suitable for fine dining, but for delivery or home use or anything fast-casual they're perfect. They seem to stand up to pretty solid abuse, and the price can't be beat. Fairly good dinner napkins for the price. I don't think they're quite thick enough to use in place of linens but they are a great napkin for use in takeout. This product is just as good (if not a little better) than it's competitor, but I've saved money on every case by switching to this product. Economy dinner napkin. A step up from supermarket napkins, but less expensive than fancy dinner napkins. These are ideal for every day use, but I'll look for something better for special events. These are a nice high quality napkin at a good price. For our crab feed, we find that these napkins stand up well for all the courses (anti-pasta, salad, pasta and crab). For cheap napkins you cannot go wrong. These napkins will definitely work and look suitable for family events and parties. Also thy don’t crumble or tear that easily. These are standard dinner napkins. The are quite large when unfolded. The come in a pack of 150, which is nice. Use these for quick cleanup! The 15"x17" white dinner napkins are a great price and terrific quality for our sweets shop. The napkins are strong and do not tear easy. These dinner napkins are exactly as I expected. They serve the purpose intended well. We will continue using them and will reorder when they are needed. GREAT DEAL!! Heavy duty napkins at the "store brand" price. Work well for everyday use, as well as catered dinners, wedding and such. Will definitely buy again. These dinner napkins are high quality and durable. Both traits are a must-have in a pizza parlor! We get compliments on these all the time. Our customers love them. Loved these napkins. There are so many to choose from so it's hard to know without being able to feel them. These are perfect. Great size, nice soft feel. Will order again. What can I say--I LOVE these napkins for outdoor dining. They are bright white, large, and have a quality, almost fabric like quality to them. I buy them again and again! These 15 x 16 2-ply White Diner Napkins are really nice and thick and don't break down too fast on you. 5 Stars out of 5! These are some of the most durable napkins we have ever used at our restaurant, and our choice in napkins due to durability, cost, and response from customers on how much liquid they can hold. These napkins are very thick and super soft. Never before trying these have I ever gotten compliments on my napkins. They come packaged nicely and are nice and thick. Same quality as comparable brands, maybe a bit softer. Cost on napkins is always an issue since we go through so many. The savings since switching to these is outstanding. These worked awesome for my family's huge reunion this past weekend! They're nice and thick. Good bang for your buck. I would highly recommend them. Please dinner napkins are great they’re made of great quality we really were surprised at how well the quality is and I would recommend these for any restaurant . These napkins are great! They are quality! The price on them are great too! If I were a customer and I got these napkins, I would think that a lot of money was spent on them. Ordered these for my wedding. They were PERFECT! We had a BBQ wedding and these along with the Moist Towelette were perfect! We have a lot left over but we use it for any family event now! The napkins are pretty thin and they are not pure white, it has an off white look when put next to a white plate on a setting. If you are not too particular with matching then it serves the purpose. We have used these before in our casual pizza restaurant. We roll silverware, which they work great for. Also, quite absorbent for a low-priced dinner napkin. This folded style 2-ply paper napkin has a much more professional appeal than traditional square napkins. It’s designed with an embossed decorative boarder and it’s thicker than cheaper lunch napkins. Softer than I expected and very durable. Each one folds out to be a pretty large napkin and just one can handle any mess. Highly recommended for a buffet station as they are durable and inexpensive. The price of these napkins are great and the quality is amazing. I was not expecting it to be good I actually had low expectations. These napkins are good quality. I was concerned that they would be too thin and fall apart easily, but that is not the case. They are thick enough to get the job done. Great value for the quality of napkin. We use these for catering events and the size of them is perfect to have out on a buffet table without taking up too much space. Great quality napkin. It's a step above other brands. You don't have to give them as many napkins in one sitting. Which saves you money in the long run! these napkins are pretty useful and easy to hand out in a carry out or sit down restaurant and are not bad for the price. These napkins are extremely soft and great quality. I will use these for guests instead of the cheap ones from the grocery store. Great purchase!! Great quality napkins. Use as everyday napkins for our breakfast/lunch time. They come in bundles which makes them easier to store and keep inventory of them. The 15" x 17" White 2-Ply Dinner Napkin - 150/Pack are a necessity!! These are inexpensive and seriously get the job DONE!! They are good enough for a persons hand, regardless if your serving BBQ or hamburgers and hotdogs. And they're good enough to wipe messes up. Theyre just great dinner napkins. Never have an event without them! Nice quality white dinner napkins. They are softer and thicker than luncheon napkins, and looks great for any setting. 3000 in a case is a great value! If you buy the fancy napkins at the grocery store stop right now. These are better and more absorbent but a fraction of the cost. These are great for the Home. Wasn’t that impressed with these napkins. The plastic bag they come in is flimsy and you have to open the whole pack even if you want to just take out one. Surprisingly good napkin for the price. Highly recommend. They look great, and are very consistent. We buy a lot of napkins, and these ones are a win. Casual, basic napkin to be used at any casual meal- picnics, barbecues, etc. Good thickness and value for the price. Will be using at our next event! These are a great every day dinner napkin. They are much more durable than cheaper lunch or beverage napkins and this means there’s less waste as well. Amazing product I only buy this for my business they hold up extremely well with the two ply and the 15 x 17 is perfect size to put utensils on. Excellent product. Size is perfect fit for any dinner party. Wouldn't hesitate to recommend this product to anyone who needs perfect disposable napkins for functions. These great little dinner napkins are ideal for home use. They are soft and absorbent. Their simple, classic design make them the perfect napkin for entertaining guests or every day home use. I am happy with this purchase. Very nice absorbency is the hallmark of these classic white embossed dinner napkins. An economical buy, the package contains 150; each is soft for comfort and 2-ply for sturdy construction. These napkins are ok for when you have guests over. They do tear easy but I like using them for a quick clean up of my daughters face after she eats because they are soft and not abrasive like paper towels. For the budget-minded buyer, this is the way to go. There are no frills on these dinner napkins, but they also don't feel cheap or thin. They do exactly what you need them to do. These napkins are the perfect size and they are priced very well. Everything shipped on time and the ordering process was incredibly smooth. We will definitely be ordering these again. I love this dinner napkin - the shape is longer than a typical inexpensive napkin at a big box store and the pattern (or lack there of) is much more mature and adult - no floral patterns. It holds up well to wiping food off of mouths and fingers without tearing, but also feels soft. These are great quality dinner napkins. They are the perfect size and do not feel or look cheap, even though they are very affordable. Very happy with this purchase and definitely recommend! Great quality dinner napkin in classic white. Want the look of a table linen without the laundry and this was perfect. The ply count makes them great quality! Nice napkins at a good price. They are not fancy but they look nice and do the job! We use them regularly at our business. Great replacement for napkins we were getting at a local superstore! Almost half the price and equal in quality. Very soft napkins, but sturdy enough to hold up for customers at our coffee/sandwich shop. JUST amazing. STURDY. White. Large enough! We are so happy we purchased an entire case. These are better than the others (shhh) we were using and they are less expensive!!! Our banquet was beautiful and we saved money with Webstaurant! These are great napkins for a reasonable price. We use them in our bakery cafe. They have a nice feel and they look great. Certainly not a napkin you'd use for a fine dinning experience, but a good quality napkin. A really nice quality white dinner napkin that is perfect for our luncheons. They are strong and durable and look so nice on the tables. The classic white 2 ply dinner napkin. These napkins are great alternative to linen napkins if you want to save money. They feature a 15" x 17" size with a 2 ply construction. These napkins can be used for a lunch, brunch, or a casual dinner. They come in packs of 150 napkins. We always keep a large stock of these napkins on hand in our catering supplies. Paper costs really drive your overall operational cost. Save money on a great quality product for less money. Order yours today and reduce your supply costs. The one hundred and fifty pack of two-ply white dinner napkins has met all of my expectations. I was pleasantly surprised at their absorbency. The white is a very clean white that looks great on any linen tablecloth. I would definitely order them again and would highly recommend. Thick and absorbent. The quality is excellent and they have a more elegant look. These napkins will get the job done and look nice while doing it. Extremely soft dinner napkins. They are very absorbent and the looks and quality are perfect for any event. They also work very well for wrapping silverware. I continue to order this product. A really great value dinner napkin. The napkin is soft and pretty good quality. The only concern I had was the packaging on the napkins was really tight, so when I took the napkins out they were wrinkled. This made them less presentable for our catering gigs. They are great to use around the house or for to go orders. This 15" x 17" White 2-Ply Dinner Napkin - 150/Pack is such a great deal. These napkins are very absorbent. Great price for the quality and quantity we get. Going to see money on your plastic products these are wonderful you will not have to buy a different brand again they will save you a lot of money . We used these to wrap our tableware for delivery orders. They feel and look high quality at an affordable price. The only minor issue is that sometimes the top parts leave tiny bits of paper, but it's really not a deal breaker. Would definitely order again. love these napkins. great price and great quality. very soft and almost gentle too. customer only use a few of these since there somewhat thicker. will defiantly order again. Good quality napkins. Good size and looked nice with the platters. They came in a good size package as well. Easy to grab quickly and the customers appreciated having them. Our favorite, go-to napkins! They are thick, sturdy and soft! One per person is sufficient. We keep them in a rectangular wicker basket for our customers to self-serve. Great napkin. We usually only have to give one per customer since they are 2-ply. They can be unfolded for even more use. Thick napkin, works well, nice look to it. These napkins feel good enough to use in more formal kinds of settings. And the dimensions are good for using in a place setting under the forks. These napkins and wonderful! They are quite thicker than I thought they would be for the price! You can't go wrong! I will deffinaltey be buying more! Good quality napkins, easy to grab desired amount. Thickness is good and product does not easily tear as with thinner napkins. The folded presentation also adds a little touch of nice to your presentation. This is a BEST BUY! We are very impressed with the high quality of this DINNER NAPKIN. This is not thin and cheap feeling. I would recommend this to everyone, no matter what the application, the quality can't be beat at an affordable cost. We will reorder. I absolutely love this product! These 15" x 17" white 2 ply dinner napkins are really nice quality! The 2 ply feels very soft and doesn't shed lint at all. We throw in some napkins on every takeout order. The napkin is a good size for our customers. We serve greasy foods and these napkins are perfect. Great price and nice quality of napkin for any occasion. Can't beat the price for quantity either - as we've shopped locally, and even with the shipping costs - these are ideally priced for most any budget. It hard to find cheap and quality napkins, and you can't go wrong with this. I will order again. I will definitely recommend buying. Thank you. Hard to find a good quality napkin at a good price point. I was pleasantly surprised when I received these napkins. I will be ordering more for sure. Clean your face. Clean your hands. Clean your friends hands if you want. IN any case you can hold all sorts of grime on this thing instead of on yourself. Who else but the webstraurantstore will give you so much for a good price? I am satisfied with these napkins and although there are plenty, I will stock up soon. Nice, guys! We have been buying these from a local vendor and he found these and were very pleased with the quality and price,but we were somewhat surprised by the shipping cost. These 15 x 17-inch white dinner napkins are nice. They are you basic table napkins but they are absorbent enough which is a good thing. And the price for a 150-piece pack is even nicer. Can't go wrong with these. Love these Napkin. The color is so white and good quality. I use to buy at another company. It costs me much more per case. I will buy from here in future. This basic Napkin is a quality napkin that matches any silverware or plate to go along with it. It's always good to have around for all napkin needs. These napkins are very nice for any dinner or party you are having. The quality of the napkin is a bargain for the price it cost. Fast shipping! Sturdy and not cheap feeling napkins! A huge plus for packing them a few hundred per pack. Will purchase again next time around! For most of my adult life I have been using paper towels at the dinner table since napkins either are priced so high at the grocery store or I do not have enough storage ( tiny NYC apartment). Web R is the answer, able to buy one at a great price. I feel so grown up! Great product. I used these napkins for my parents golden anniversary, and they looked beautiful on the table set up. Very durable, cleans up mess very well. Amazing product at such a great price. Very absorbant and hold up very well on liquid spills. I would recommend these for any special occasion. These are so soft! The two ply napkins are thick and feel great. They are absorbent and one can be used instead of a pile of thin napkins. AWESOME PRODUCT!! I loveee this napkins, they are so soft and resistant, plus you get tons of them for your $$. Can't get a better deal anywhere. These are of a great quality, nice and thick and you most definitely get your money worth. I am glad I ordered extra, any leftovers from our wedding will be great to have for all the parties we host as well. These are nice and thick and I'm really glad to have found them. They aren't much cheaper than my food service company but it is a pretty good product. Essential for every dining room. Customers love them. Very durable. Easy to wipe messes without tearing or ripping. They also look fantastic on your tables. Very nice napkin. Exactly what I was looking for... Looks nice, large enough to be useful, very absorbent. Very happy with my purchase. Well definitely be ordering again! Napkins came well packaged and will certainly serve their purpose for my indoor outdoor wedding. Great for table settings, buffet style weddings or any outdoor casual event! This large soft white napkin is 2 ply for maximum absorbency. If you could pick just one, this will be the only napkin you will need. These are a little bit on the thin side for using for a nicer dinner (like holidays), but I find these perfect for more informal gatherings. They are a nice size and are worth the money. These are very good napkins. The 15" x 17" size is ideal, but we preferred the 3 ply vs the 2 ply napkins so we took one star off. Thick napkins that are quality suitable. We use them in our business for take out, customers are satisfied with them. Even the smallest thing can bring big rewards! Great product at an even better price. Look at your food distributors and local warhouse stores. You'll see your spending far too much for this product. This is a quality napkin that costs about half as much as my local distributor wants. My customers love the thickness and I love the price! We love these dinner napkins. They look good. They store easily. They are perfectly absorbent. The price is right, especially through Webstrauntstore.com. We will continue to order them. This is the best price on napkins I have found. The quality is great and they are really thick and sturdy. They have a nice little design as well. Good, heavy duty napkins with a fine dining look to them. Will be using for a wedding here soon and recommend these for any table setting. These dinner napkins are great. I ordered several packs and will order more soon. These napkins are of high quality and are very absorbant. Great product. Great Napkins! Great price for the amount of napkins that come in a case you can't go wrong! We will purchase the again for our events. I was very surprised at the quality of these 2 ply napkins. Good price too. Be sure to consider shipping cost and try to bundle this with an already bulk order. The 15x17" dinner napkins are a very generous size and perfect for both formal and informal settings. They are thick and of the utmost quality. I am very impressed. These paper napkins are a nice alternative to linen, they are large, thicker and better quality then others we have tried. Good Value for 3000. These napkins are an economical and quality option. We use the napkins to wrap silverware and have found that they're suitable for that purpose. These are relatively thin 2-ply, so expect to go through a significant quantity if your restaurant serves pizza or other items that tend to require napkins. These napkins are perfect for dinner service. They are easy to lay over your lap and the price is quite reasonable. We will be purchasing again. We use these napkins for our faculty potlucks and pay day treats at school. They're a great size and a decent quality for the price. These were good quality napkins for the price. I prefer the full sized dinner napkins but these are good for lunch counter types of uses. Great napkins. The 2 ply fold makes them look fancier and not cheap. They are packed tight so sometimes some napkins come out wrinkled. Not a draw back but wanted to point out. Great quality. I have ordered these several times and the quality has remained great. Can use as is folded or open the napkin up and make designs with them. These were a great value, but in retrospect, for a wedding, they were a little thin. The description was spot on, but I was looking to save some money by getting the cheaper ones. For a regular party these would be perfect, however if I could go back, I would spend the extra dollar or two an get the thicker ones. Still an excellent value for what I paid, just not recommended for a wedding. Get the nicer ones. EXCELLENT quality, thick and they look nice. They were also a perfect fit to do silverware roll-ups. Good bang for the buck, as they look more expensive than they are. These items were shipped within a day of ordering them. We are extremely happy with the quality and price of these items. We will be ordering these again and again! I used these napkins for an event I had over the weekend. And they held up perfectly! I was a little concerned about the durability of them, because I had chosen them for the economic price. Needless to say, I will be purchasing these napkins again for every occasion. Nice napkins, GREAT PRICE! These napkins are the perfect combination of affordability and quality. They are thick and absorbent. They feel like high quality napkins but do not break the bank. We highly recommend these napkins. These are very good quality napkins, very absorbent! We use these napkins for all kinds of events here at church. The price is also comparable to others. These napkins are great. They are really soft but very durable. They're lower priced and better quality than the ones we were previously using - win! Great napkin for a great price. These are a large napkin that has a great weight for a disposable product. These are very durable and last for the entire meal. I got these as back-up napkins for a formal event that we rented cloth napkins for. These are a very nice quality and will purchase more for future events. These napkins are a durable but inexpensive solution that is great for both our dine in and take-out customers. They are sturdy enough to not have to use an excessive amount. Item met all my expectations. Elegant, soft, durable, nice rose design on the napkin. I strongly recommend this item for the bar napkins. Worked wonders. I thought that having 300 people I was going to need a lot of napkins, but these were more than enough, I'm glad I got them though, they're really good for the price. Excellent product. I searched everywhere for a reasonably priced napkin. They are high quality, hold up well and are reasonably priced. We were disappointed with these napkins. They are very soft and feel more like facial tissues than napkins. They don't hold up with use. Good value though. Thank you for reviewing this product! If you're looking for durable napkins, we recommend the Marcal Eminence Bella 2-ply 15" x 17" white dinner napkins. Good napkins for the price. Seem to hold up pretty well. You're always gonna have the need for a few extra napkins and these do the trick. So many napkins for such a wonderful price. I like the thickness because the napkins did not fall apart. Great quality napkins that looks expensive. Napkins are not as thick as I expected but still they got the job done nicely. May order again. Satisfied with shipment.Arrived on time for event. These are a great high quality napkin. We put one in each customers box lunch. We use a cheaper one out by the condiments though if they need more napkins, but usually one of these is enough. Ok dinner napkins, not as thick as I expected. They work though and are good for casual dining restaurants or catering. For the price, they can't be beat!!! Great Napkin for an even better price. We use these for rolling our silverware and they work perfectly. While they feel a little cheaper then our old napkin, they do work just as well and are cheaper in price. These are high quality 2 ply dinner napkins! Nice for small restaurants and cafes that have a large to go basis! Comfortable yet absorbant too!! Great napkins at a great price, they are soft enough for table use but sturdy enough so that they don't fall apart during use, I really like how it's available in case size or less, allowing me to choose what I need based on space availability. Its softness and embossed design help the dining area to boast the appearance of my restaurant.It can be replaced the expensive cloth napkins in case of running out.Keep using them for years.Highly recommended. I bought these napkins because they are a great value for everyday use. When I buy the bargain napkins in the store, they never hold up, once they get a little wet they fall apart and the kids wind up using 2 or more. These napkins are soft and strong and one is all I need. They cost less than the store bought napkins and they are far superior. These are good for a picnic but for restaurant service we use a three ply napkin, and this is two ply, so I didn't order them again. Nice value for the price. I love the smaller convinent packages of 150 pieces per pack, makes for easier storage. I would recommend for all restarants needs. Much cheaper than the local distributors and the quality is great. The only downfall is that we roll our silverware and the napkins are folded. We do a lot of ribs, bar be que and other "messy" stuff. I like a generous napkin that can stand up to the chalange - this is THE one. Great product at a great price. These napkins have substance to them. They hold up really well and prevent people from taking too many. One is usually enough for the meals that we serve at our church.